The last few weeks have been pretty exciting for us at Planet Blockchain. With Coinbase proposing to list 3 of our top currencies, we’ve been working hard on our own contribution to the cryptocurrency space. A real pain point for us when using Cardano was having to use Daedalus and sync it with the blockchain. This takes ages and is prone to require restarting Daedalus, and/or your computer! No thank you! Even when you achieve the Nirvana state of a sync’ed Daedalus, you now have to input your 12 secret words, aka your private key, to restore your wallet. If you’re not on a device you own and trust then this is obviously not an option. The owner of the device, or, heaven forbid, website, you enter your 12 secret words into has the ability to take all your funds, if they want to. They might do it instantly, they might do it tomorrow, or they might do it in a years time. A light wallet, or mobile wallet, where the only information you put into the wallet is your public address, or addresses. There is absolutely no way to take someone’s funds just from their address, which makes this a secure solution to looking up your balance. Many of these solutions exist for popular currencies like Bitcoin. If only there was one for Cardano. Luckily for you, dear reader, we’ve built one. Once you’ve set up your wallet through Daedalus, you can copy and paste your addresses into the mobile wallet in order to track your balance(s). Make sure to always protect your back up phrase for your wallet and never share it with anyone. Including us, and any other wallet software. We at Planet Blockchain are super excited by Cardano and the cryptocurrency space in general and commit to bringing you the highest integrity information on the topics we care about the most. Thank you for being part of our small community and we hope you enjoy the app. You can read more about it here. In this post, we will be looking at the difference between Bitcoin (BTC) vs Bitcoin Cash (BCH). Bitcoin (BTC) is a digital currency which was created in 2009 by a mysterious entity using the alias Satoshi Nakamoto. Eight years later on 1st August 2017, a ‘hard fork‘ of Bitcoin (BTC) created Bitcoin Cash (BCH). There are essentially two different idealogical camps in the the Bitcoin (BTC) vs Bitcoin Cash (BCH) debate. It all started as a discussion about how to change Bitcoin. Something was needed to help it cope better with the increasing number of people using the cryptocurrency. However, after years of debate, two different ideological camps arose with opposing views on how Bitcoin should scale its protocol. The miners wanted Bitcoin to use bigger blocks while the users and developers wanted to implement SegWit, an upgrade that would compress transaction data, so more transactions could fit in each block. The argument about how to scale Bitcoin has centred around restrictions imposed by the original design of Bitcoin. These limited the way in which transactions were processed and put into the public ledger of transactions, called the blockchain. The rationale for this was to put the security of the system ahead of functionality which, given the small number of people using Bitcoin in those early days, wasn’t an issue. The options for lifting this restriction however became a sticking point between different groups of developers and their various supporters. One group, consisting of the Bitcoin core developers, decided on a gradual approach that would first make more space in the ledger by shuffling how things were stored. And then as a second step, increase the size of the “blocks” or groups of transactions that were added to the blockchain (the ledger that records all of Bitcoin’s transactions). Another group of developers lead by ex-Facebook Developer Amaury Séchet, however, disagreed with this approach. They didn’t believe it would actually go ahead and came up with a different design. This essentially meant diverging from the existing Bitcoin blockchain and creating their own version. The proposal of the Bitcoin core developers, called SegWit2x, wanted to improve the way Bitcoin worked by saying that signatures could be moved to a separate piece of paper, one that is filed along with the sheet containing the transaction information. Because there is more room on the paper, more transactions can be written down. The other proposal was to set a timeline through which the system would allow two sheets of transactions instead of just one.The developers behind Bitcoin cash didn’t agree with the idea of separating the signatures from the transaction. They thought this was a “hack”. Bitcoin (BTC) vs Bitcoin Cash (BCH): Same Goals But Different Directions! The goals of the two camps were the same, but neither was willing to compromise on how to get there. Therefore, Bitcoin forked into two different currencies, each sharing a common transaction history from before the fork. Bitcoin Cash is the chain supported by the miners who wanted larger blocks, and the regular Bitcoin chain is the one supported by the core developers. In terms of the practical intents and purposes of most users, there is very little difference. However, it is imperative to understand that Bitcoin (BTC) and Bitcoin Cash (BCH) are now two entirely separate currencies. Supporters of Bitcoin Cash looked at SegWit as being an inadequate solution to the problem of scalability. It was also against what Satoshi had envisioned, especially with off-chain solutions. Even if the upgrade was done, the pro-Bitcoin Cash (BCH) team felt that the way forward lacked transparency and would undermine the blockchain’s decentralization and democratization. In short, the difference is that BTC chose to implement SegWit and has the Lightning Network while the BCH community disagreed and pursues on-chain scalability. Both Bitcoin (BTC) and Bitcoin Cash (BCH) run on the Proof-of-Work (PoW) consensus algorithm. A Proof-of-Work (PoW) coin uses miners to confirm transactions on the blockchain. This isn’t the most environment-friendly option, as a large amount of energy-consumption is involved; but it is the most effective, compared to other consensus algorithms like Proof-of-Stake (PoS). Besides not being environmentally friendly and slow there is also an added risk of a 51% attack on the network. One key difference between Bitcoin (BTC) vs Bitcoin Cash (BCH) is the difference in block size. Bitcoin has a 1MB block size, while Bitcoin Cash originally had an 8MB block size. In May 2018 Bitcoin Cash initiated a hard fork to increase the size of the BCH block from 8MB to 32 MB. The upgrade also added new OP codes to its codebase. Bitcoin Cash (BCH) protocol allows for more transactions per second which translates to faster payments and lower fees. However, Bitcoin has much greater security and stability, as there is more mining support and infrastructure behind it. So what does the future hold for Bitcoin (BTC) vs Bitcoin Cash (BCH)? Do you think there will be a greater demand for Bitcoin Cash (BCH) than Bitcoin (BTC) in the future? We will have to wait and see! As part of what HTC claims is its “effort to expand the blockchain ecosystem,” the company introduced its latest blockchain phone known as the HTC Exodus this week. HTC sees the Exodus as a handset that will let owners keep their data – and blockchain currencies – private and secure on the device rather than in the cloud, where your sensitive information may be easier to extract and tamper with. The announcement comes almost one week before the launch of its latest flagship, the HTC U12. Its bid for elevated smartphone security also comes at a time of peak scrutiny for security and data privacy. However, it is not the first time the concept of a blockchain smartphone has been introduced. In April, Sirin Labs announced that Foxconn will manufacture its blockchain powered smartphone, FINNEY. The Taiwanese firm revealed its vision for the future of smartphones at the Consensus 2018 cryptocurrency conference in New York, explaining how it will utilise blockchain technology to support cryptocurrencies like Bitcoin and Ethereum. “Our vision is to expand the blockchain ecosystem by creating the world’s first phone dedicated to decentralized applications and security,” HTC states on a website dedicated to the new device. HTC hasn’t released any official images of what the Exodus will look like. Instead, the company posted a rough sketch of what appears to be the smartphone’s components. Please see below. Initially, it will launch with support for Bitcoin, Ethereum, Dfinity networks, and Lightning Network, but the company says it will eventually support the entire blockchain ecosystem. HTC plans on creating a native blockchain network with all eExodus phones, in an effort to double and triple the number of nodes of Ethereum and Bitcoin. No release date or price has been set for HTC Exodus but you can reserve the HTC Exodus phone online. The company has hinted it might even accept cryptocurrency when the handset does go on sale. The HTC Exodus exists separately from HTC’s main phone business, and it is not the same phone planned for HTC’s May 23 announcement. In fact, the Exodus is one initiative from Phil Chen, HTC’s new decentralized chief officer, who will focus on the company’s blockchain and cryptocurrency efforts. Chen previously ran the HTC Vive VR headset business. HTC joins a growing list of top technology companies foraying into blockchain. Earlier this month, Facebook launched a new blockchain division as part of its management shuffle. The company is also said to be exploring the possibilities of launching its own cryptocurrency. Last month Samsung was reported to be building a blockchain network, but for its own global supply management. Huawei has also been rumoured to be working on a blockchain phone. While the device was largely welcomed on social media by those within the cryptocurrency space, some suggested HTC was the latest firm to use the term ‘blockchain’ as a marketing tool. Blockchain (and Bitcoin) are very much nascent technologies right now. However, although they are full of promise and potential there is still some way to go before they will achieve mainstream adoption. Only time will tell if the HTC Exodus ends up being another step towards blockchain reaching the masses. One small step for @SatoshiLite. One giant leap for blockchain. Team @HTCExodus, @philchen913 @htc are honored to have Charlie Lee to join as our advisor. In this article we will be discussing Nano vs Bitcoin Cash. As people begin to see the flaws of Bitcoin, and invest elsewhere, we see coins like Nano and Bitcoin Cash (BCH) picking up investment. In this article, we will look at these two cryptocurrencies and evaluate which is the stronger currency of the two. Nano vs Bitcoin Cash – which cryptocurrency is the leader of the pack?! Nano has been tipped to become the next Bitcoin. The main reason for its fast growth and success is because of its architecture. Though the cryptocurrency operates by providing a decentralized model of bypassing centralized institutions such as banks, it design utilizes block-lattice architecture and delegated Proof of Stake (PoS). This eliminates the need for miners, makes the network fast, and lighter. These unique features and applications mean that Nano is indeed better than Bitcoin and most cryptocurrencies that use Proof of Work (PoW) and standard Proof of Stake (PoS) consensus models. Bitcoin Cash is a decentralized peer-to-peer cryptocurrency that was developed from the Bitcoin Core. Bitcoin Cash was formed as a hard fork of Bitcoin. In some cases, you will get the cryptocurrency being referred simply as an upgraded/ peeled/ or forked version of Bitcoin core software released in August 2017. A further Bitcoin Cash hard fork took place in May 2018. We will now evaluate the advantages and disadvantages of Nano vs Bitcoin Cash. What are the advantages of Nano? If you have some cash and want to send abroad using the banking system, the chances are that it will be very expensive. Even the cryptos that came earlier such as Bitcoin and Ethereum are still very expensive. For example, the cost of sending cash using Bitcoin network was more than $ 50 in January of 2018. However, Nano has ushered a new dawn in cryptocurrencies where users can make transactions for free. This is one of the benefits drawing a lot of people to the network. One notable thing about cash stored in the bank is that bank account details can easily get leaked to third parties. Worse still, your bank account can easily get frozen if a court battle whirls to your doorstep. However, Nano is an open source and anonymous network that is hidden from third parties. When people use the standard payment services such as PayPal, MasterCard, and banking, they feel passive. Once they make the savings or send cash, they get the sense of accomplishment and move away. Like other cryptocurrencies, Nano helps people to join, use, and own the network. This means that you are part of the network and your vote will be required when consensus is needed. When people join the cryptocurrency network, they are interested in getting the most secure option for their assets. The delegated proof-of-stake model used in the Nano system helps to keep it secure from miners who might have malicious intentions. The commitment of the Nano development team has also managed to keep the system free from hackers since inception. These considerations have won the Nano the tag of the most secure blockchain in the crypto world. If you want to send cash abroad on the weekend or at night, the chances are that it will be impossible. Even those that have some mobile activated applications only allow people to send a limited amount of cash. However, Nano cryptocurrency network is different. The crypto network allows users to operate with utmost freedom. Whether it is at weekend, public holiday, or at night, you are sure of being able to use the network. The effectiveness of a crypto network is partly gauged by its value and community. For Nano, these parameters have been experiencing positive growth in since inception. As the value took an upward trend early in 2018, the crypto community also kept growing. Many people believe that this growth will keep growing and the crypto could become the next Bitcoin. What are the disadvantages of Nano? While the benefits associated with Nano are very many and appealing, it is important to appreciate that the network also comes with a lot of risks. Like other cryptocurrencies, users in the Nano network operate anonymously. While this is seen in many ways as an advantage, it is also a great demerit. The anonymity makes it easy for users to fall to scammers. Other risks of operating in the Nano network include. Though the Nano network development team has been working extra hard to keep the network safe, and no successful attack has been reported since inception, you cannot be 100% secure. The third generation cryptocurrencies such as Nano are mainly aimed at addressing shortcomings noted in the previous networks. For example, Nano targets addressing shortcomings noted in the Bitcoin and Ethereum networks. However, newer and more advanced cryptocurrencies are also likely to emerge in the future and pull down the appeal of Nano. This could lower its value and diminish the trust people have in it. Cryptocurrencies such as Nano have demonstrated to be highly volatile. Every time that something related to the crypto industry takes place, Nano and other cryptocurrencies respond immediately. When China announced that it was going to burn ICOs (Initial Coin Offering), Nano value responded by shifting downwards. A similar downward shift was noted when a cryptocurrency exchange was hacked in South Korea towards the end of 2017. Every country in the globe is working on some form of regulation to help control cryptocurrencies. From China to the United States, the governments are feeling threatened by the cryptocurrencies so much that they want to limit their growth. China has already outlawed ICOs and looks committed to suppressing other crypto related activities. If most countries pass harsh regulations as anticipated, there is a risk that adoption and use of Nano could go down or diminish completely. While the first and second generation cryptocurrencies were aimed directly offering an alternative to banks, third generation cryptocurrencies have been working on partnerships. For example, OmiseGO and Ripple provide banks with a platform for enhancing payment as opposed to looking like a direct threat. But Nano architecture aims at replacing the banks especially with its zero transaction fee. This could deny Nano support from such financial institutions as they channel their clients to other friendly networks such as Ripple. The fast growth of blockchain technologies is an indication of the public acceptance and approval. At first, Bitcoin and other cryptocurrencies were considered disruptive and a threat to the conventional institutions such as banks. But the narrative has changed over time. Today, even governments are starting to appreciate the huge benefits that come with using blockchain technologies. Bitcoin Cash has particularly stood out because of its unique design and fast growing value. Here are the main benefits to anticipate after joining the network. The main attraction drawing more users to the BCH network is the high level of privacy. The team behind Bitcoin Cash network targeted enhancing anonymity for all their operations. From traders to individuals, no one wants third parties such as banks to know their personal details. All the transactional info in Bitcoin Cash network are encrypted so that even miners who confirm transactions can only ascertain the amount but not the owners. If you want to make payment on a weekend, during public holidays, or at night through the bank, it is impossible. Most of these institutions only work between 8 am and 4 pm. However, Bitcoin Cash empowers you to make payments any time of the day or night. Because you have the network right in the wallet or node, sending payment is only a click away. This is the freedom that many have yearned to get for years. When you join the Bitcoin Cash network, it becomes yours. That is right. The Bitcoin Cash network is owned by users. You are part of the system and will be involved in making the decisions on the network. Instead of relying on a centralized authority, Bitcoin Cash relies on the consensus of users spread on different nodes in the network. If your cash is in the bank, the risk of getting seized is very high. A case can easily whirlwind into your doorstep and drag you to court. Whether it is a social media or workplace issue, you can easily get involved without necessarily committing a criminal offense. With such risks, the savings in the bank are an easy target by lawyers. However, joining and storing your fund in Bitcoin Cash provides the freedom from third-party seizures. You operate anonymously and at no point will the court freeze your Bitcoin Cash account. As more cryptocurrencies enter into the fast-growing industry, users want to join those that give them better prospects for growth. Bitcoin Cash is one of them. Though it was only 5 months by close of 2017, it managed to hit top five most valuable cryptocurrencies by then. Its growth has been remarkable with experts in cryptocurrencies indicating that it could easily rival Bitcoin. What are the disadvantages of Bitcoin Cash? Just like Bitcoin Cash has numerous benefits, it also comes with a number of risks that users should know of. The hacking in a South Korean exchange at the end of 2017 saw many cryptocurrencies including Bitcoin Cash slump in value. Therefore, no one can be sure of what will happen to Bitcoin Cash in the next few days, months or years. Here are the main disadvantages associated with Bitcoin Cash. Bitcoin Cash was forked from Bitcoin to create a new and more effective cryptocurrency. With new cryptocurrencies joining the industry at a supersonic speed, the risk of Bitcoin Cash getting overtaken by newer and more effective networks is rather high. This could see Bitcoin Cash getting relegated to the back seat as people scramble for the new option. From the US to China, the topic of cryptocurrencies is a hot potato issue. There is a general feeling that many governments are about to implement laws aimed at punishing cryptocurrencies. For example, Russia and Thailand have cautioned their traders that upcoming laws could make their cryptocurrency related operations illegal. The looming regulations are making a lot of people shy away and could pull down the value of Bitcoin Cash within hours after getting passed into law. Like other cryptocurrencies, your Bitcoin Cash can also be lost. You could easily lose BCH through hacking of the personal computer, attack on the exchange, or sending to the wrong address. The danger of losing BCH is that they are very difficult to restore. In most of the situations such as sending BCH to the wrong address or getting hacked means that the coins are gone forever. The anonymous nature of Bitcoin Cash has become an instant attraction to fraudsters. Because the transactions are completely encrypted, scammers are sure that they cannot get discovered. This puts users at a risk of getting drawn to scams without knowing. Some scammers often release fake ICOs (Initial Coin Offerings) and steal from unsuspecting clients. Others might opt to acquire or make fake products and sell through the BCH network. You must be extra careful to only buy and carry transactions with trusted addresses. While the fast-rising demand for cryptocurrencies has drawn a lot of people into the industry, the level of volatility is very worrying. Within a very short moment, the value of Bitcoin Cash can plummet and cause huge losses. This has been experienced in other cryptocurrencies such as Ethereum during the DAO attack and Bitcoin during the Silk Road Scandal. Many people have said that the whole idea of Bitcoin Cash was little more than a scam to gain money from the Bitcoin name. Numerous lawsuits have been filed against people who are claiming Bitcoin Cash as being ‘the real bitcoin’, which is marring the currencies reputation. In the Nano vs Bitcoin Cash debate, both have their advantages and disadvantages as we have seen. However, overall, Nano seems to have the largest scope for growth. The recent ‘‘Bitgrail hack‘ wasn’t a flaw with the technology of the network – the price dip was purely speculative and emotional. Many coins have been hit hard by the 2018 ‘bear market’ but it seems in comparison Bitcoin Cash has been hit the hardest. Newer altcoins are taking over. Furthermore, an article was recently published stating how Bitcoin Cash might be in trouble. Meanwhile, Nano is among the top coins trading today. Having evaluated the advantages and disadvantages of the two cryptocurrencies, it would seem in the Nano vs Bitcoin Cash debate, Nano is the stronger cryptocurrency of the two. It is also a hot contender for the most promising cryptocurrency of 2018. New Economy Movement (NEM) started off with the ambition of making sure digital currency distribution was widespread and fair. It is one of the few altcoins whose concept is to address all the inherent issues affecting cryptocurrencies such as Bitcoin. Issues such as scalability, energy consumption, ease of use, incentive to use, consolidation of power by miners and governance are what NEM seeks to address. Launched in 2015, it brings plenty of exciting new ideas to the blockchain. As with many cryptocurrencies, NEM developers are pseudonymous and it was started by a Bitcoin Talk forum user called UtopianFutur. The inital design was a fork from NXT, but it swiftly got rebuilt from the ground up on its own source code. NEM has many unique features such as multisignature accounts, encrypted messaging system, and the Eigentrust++ node reputation system. One of the major advantages is its transaction speed. It is for these reasons it is generally viewed as an evolving solution, replete with an outstanding core blockchain technology. The cryptocurrency that runs on it is called XEM. NEM is primarily used in Japan, but also elsewhere in the world. One of the key aspects of NEM is its unique consensus mechanism of Proof of Importance. This looks to overcome the problems that can be found in the Proof of Stake model by identifying an account’s overall support of the network. It does this by accounting for three factors: vesting, transaction partners, and number and size of transactions in the last 30 days. NEM has a feature called harvesting. It doesn’t require any special hardware, you do need to have at least 10,000 vested XEM coins in a single wallet. Anyone running Supernodes and processing transactions get paid by processing the payments for the network. The advantage of harvesting over mining is that it uses a lot less electricity, which means lower transaction fees. This also means that, NEM is much a more energy-efficient cryptocurrency and better than the environment than a coin like Bitcoin (See our post on Bitcoin’s energy usage). It’s used in a commercial application, called Mijin in Belgium. 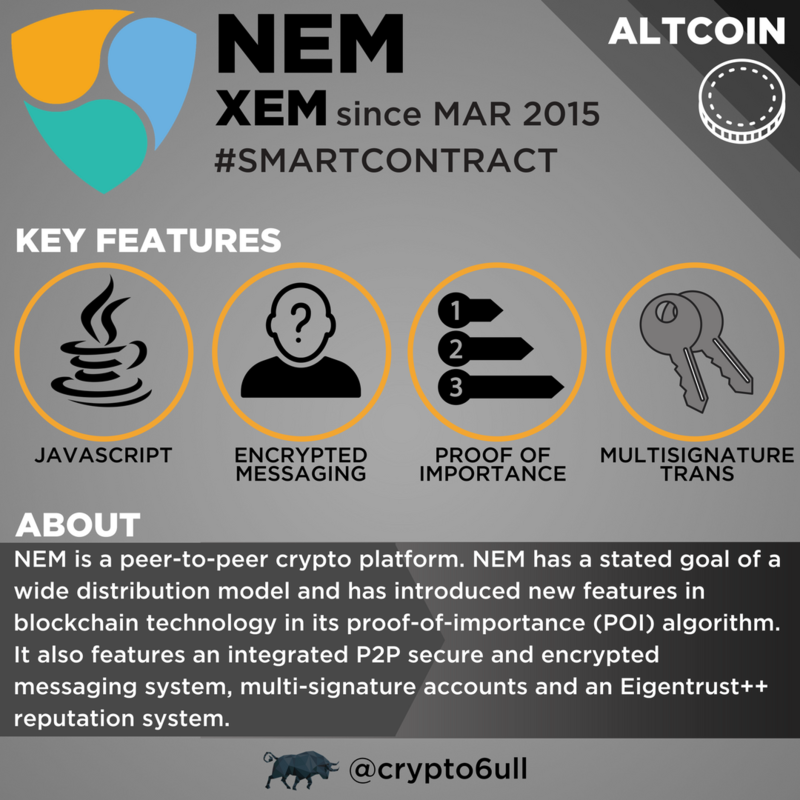 Other than that, NEM is still in the early stages and the only real thing you can do with XEM is transfer between people and wallets; there isn’t yet any tangible things you can buy with it. You’re going to want to download the NEM Nano wallet to your PC or mobile phone, and follow the instructions to set it up. To purchase XEM, you’re limited to a few exchanges right now. Bittrex allows you to purchase XEM with BTC, USD or ETH. The New Economy Movement (NEM) has attracted a lot of attention recently. NEM is a movement that aims to empower individuals by creating a new economy based on the principles of decentralization, financial freedom, and equality of opportunity. One of the aspects about NEM that particularly interested us is known as ‘Proof of Importance’. Please see infographic below. What is Proof of Importance? Proof of Importance is the underlying technology behind NEM which determines who gets to verify transactions. This consensus mechanism is similar to Proof of Stake (PoS) in that it requires a certain amount of cryptocurrency (10,000 XEM in NEMs case) to verify transactions. It differs to PoS in that it solves the issue of a person having more stake being more likely to verify transactions, thus receiving more rewards. In other words, PoS helps the rich get richer, and PoI aims to alleviate that. PoI solves this dilemma by assigning consensus addresses and an importance score. The importance score can be thought of as a reputation score (kind of like Karma on Reddit). A higher score means the network trusts you more to verify transactions. In PoI, your chance of verifying transactions isn’t entirely dependent on how much you have to stake. Instead, it’s based on the number and quality of transactions you’ve previously done. What is a quality transaction? Well, simply sending yourself a bunch of XEM between addresses isn’t going to do it. You must have sent at least 1000 XEM to addresses holding at least 10,000 XEM staked within the last 30 days. One risk of Proof of Stake is that people simply hoard as many coins as possible and reap the rewards from block creation. This concentrates wealth while discouraging transactions. These transactions are what keeps the network running. PoIs importance score means that hoarding results in a lower score. Spreading XEM around increases the score. Therefore, being an active participant pays better than hoarding. You may think that it’s pretty easy to hold a few addresses, pass some XEM between them and shoot up your own importance score, however, the algorithm attempts to prevent this. One way in which it does so is by actually lowering the importance score for accounts that transfer out, then receive XEM. Also, making everyday purchases or sending XEM to an exchange won’t affect your importance score. Dash – a fork of Litecoin – includes the features of Litecoin (limited supply, 2.5 minute block times, proof-of-work (POW) validation system) along with the ability to transact instantly, via an instant send feature, and anonymously, via a private send feature, and to vote on updates to the network. This is implemented through a two-tiered validation system. The first tier involves the traditional mining/POW system from Bitcoin, Ethereum, Litecoin, and many others. The second tier includes a network of Masternodes which are required to maintain a minimum of 1000 DASH. Each node that maintains this minimum is deemed a Masternode that participates in confirming transactions instantly, anonymizing transactions by mixing public keys so you don’t know who the sender or receiver are, and voting on updates to the network. In exchange, the Masternodes receive rewards of about 2 DASH to every Masternode per week. To perform an objective analysis, each cryptocurrency is rated based on the following factors: (1) validation method; (2) leadership; (3) community participation in development; (4) transaction volume and market capitalization; (5) industry participation; (6) security; (7) usability; (8) technical features; (9) growth; (10) legal risks; and (11) estimated time of arrival. Dash uses the same proof-of-work (POW) system as Bitcoin to validate transactions, but a different mining algorithm in X11. Originally, miners could run X11 on CPUs but hashing power has increased considerably and now requires ASICs. As described above, Dash has a second tier made up of Masternodes that perform decentralized governance by voting on updates, mix transactions to anonymize them, and instantly validate transactions within a second as opposed to about 2.5 minutes to validate a transaction via the first tier POW system. Masternodes receive 45% of the block reward (currently 5 DASH per block), miners obtain another 45%, and the remaining 10% goes to the treasury system for development. Each Masternode has 1 vote for updates to the network. If a threshold number of Masternodes vote in favor of the update then it is enacted. In other systems like Bitcoin and Ethereum, updates to the network are made through a fork where the chain splits into two. Miners effectively vote for the update by continuing to validate transactions from the old chain or moving over to the new chain. However, this voting occurs after the fork, so the developers can add an update which does not end up being enacted if the miners continue to devote computing resources to the original chain. In Dash’s Masternode governance system, updates are voted on before they are added into the protocol. Dash is led by its creator and lead developer Evan Duffield and the Dash Core Team, a company made up of about 30 employees. Duffield has received some criticism for the release of Dash where almost 2 million coins were released due to a bug when the code was forked from Litecoin. Although Duffield claims that the community did not want him to relaunch or perform an airdrop, some suspect he did this on purpose to ensure he would have a significant portion of the coins. In this manner, he could control the network through the use of Masternodes by running a large percentage of them and voting for his own proposals and against proposals that did not directly benefit him. To be fair no one knows how many Masternodes are owned by Duffield or members of the Dash Core Team. Dash is 13th in market cap (~4B) with a transaction volume of about $130M per day. A few online retailer and businesses accept Dash such as Dash Video Casino, Organic Contraband Coffee, and a few other small companies. Additionally, it can be purchased through several exchanges, such as Bittrex, Binance, Bitfinex and many others. There are also Dash ATMs in select locations throughout the world. However, Dash has yet not received widespread acceptance and may only be used at very limited locations. In terms of security, Dash has many of the same advantages and disadvantages as Litecoin. Some argue that the second tier of Masternodes leads to additional security vulnerabilities, because the large cost (1000 DASH) of running a Masternode prohibits individual users or small entities from participating. Thus, only large entities may be able to run Masternodes which can lead to centralization. On the other hand, currently there are over 4700 Masternodes running on the network and while some speculate that the Masternodes are owned by a few entities, it seems more likely that there are at least a thousand owners. Accordingly, it is unlikely one company can take over the network or a hacker can attack one company that owns thousands of Masternodes and gain control. Like Litecoin, Bitcoin Cash, and NANO, Dash is intended to be used for day-to-day transactions. With the advent of the instant send feature, transactions can be completed in less than a second which allows for very fast cash like transactions. Additionally, Dash can be used with an element of privacy due its private send feature. There are many reasons why someone would want to transact privately. For example, on the Bitcoin network hackers and thieves may identify the wallets with the largest number of coins and target them. As described above, Dash has many of the same features as Litecoin. The main difference is its second tiered network of Masternodes that performs decentralized governance and instant and/or anonymized transactions. Decentralized governance allows for the Masternodes to vote on updates to the network (where each Masternode has 1 vote) before they are implemented into the protocol. 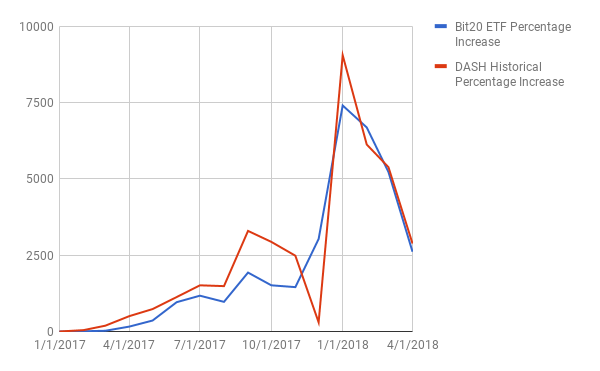 For example, Dash has dynamically increased block sizes through these updates during periods of high transaction volume. Though this seems to be more efficient than alternative mining systems which fork the code to perform an update, critics argue that a user or company, such as Evan Duffield or the Dash Core Team could control the voting power and thus, the network by owning enough Masternodes. Furthermore, unlike Monero the transactions executed by the private send feature are not fully anonymized. For one, they can be traced to previous transactions that were not anonymized. Additionally, the private send feature is a coin mixing service based on CoinJoin. The coin mixing service breaks down transactions into specific dominations of 0.01, 0.1, 1, and 10 DASH, mixes the denominations with similar denominations from other users and includes several outputs to each person’s wallet at a different address called a change address.Though the senders are anonymous in this implementation the transactions are not. Other privacy coins such as Monero utilize Ring Confidential Transactions to anonymize the transactions themselves. Being in both the daily transactions and privacy coin arenas, Dash has many competitors including Litecoin, Bitcoin Cash, NANO, Monero, ZCash, and Bytecoin. Nevertheless, Dash does set itself apart via its two-tier system that allows for decentralized governance and by providing both privacy and daily transactions features in one coin. If only a small percentage of altcoins survive in the long term as many have predicted, Dash may be one of them since it implements multiple features. Dash launched in 2014 and is now fully developed and ready for use. However, the Dash network has not been tested to the same extent as Bitcoin’s. The two-tiered network sets Dash apart in a unique way and allows for even more features to be implemented through its decentralized governance. Nonetheless, as Dash has not yet shown it is the best at any single feature (e.g., daily transactions, privacy), users may prefer coins that can focus on and perfect individual attributes within cryptocurrency over one that addresses several. Analysis brought to you by the hugely talented Cameron Pick. Originally published on https://cryptonalysis.net which everyone follows on Twitter.